Private Investigator Edwina "Eddie Shoes" Schultz's most recent job has her parked outside a seedy Bellingham hotel, photographing her quarry as he kisses his mistress goodbye. This is the last anyone will see of the woman...alive. Her body is later found dumped in an abandoned building. Eddie's client, Kendra Hallings, disappears soon after. Eddie hates to be stiffed for her fee, but she has to wonder if Kendra could be in trouble too. Or is she the killer? Eddie usually balks at matters requiring a gun, but before she knows it, she is knee-deep in dangerous company, spurred on by her card-counting adrenaline-junkie mother who has shown up on her doorstep fresh from the shenanigans that got her kicked out of Vegas. Chava is only 16 years older than Eddie and sadly lacking in parenting skills. Her unique areas of expertise, however, prove to be helpful in ways Eddie can't deny, making it hard to stop Chava from tagging along. Also investigating the homicide is Detective Chance Parker, new to Bellingham's Major Crimes unit, but no stranger to Eddie. Their history as a couple back in Seattle is one more kink in a chain of complications, making Eddie's case more frustrating and perilous with each tick of the clock. 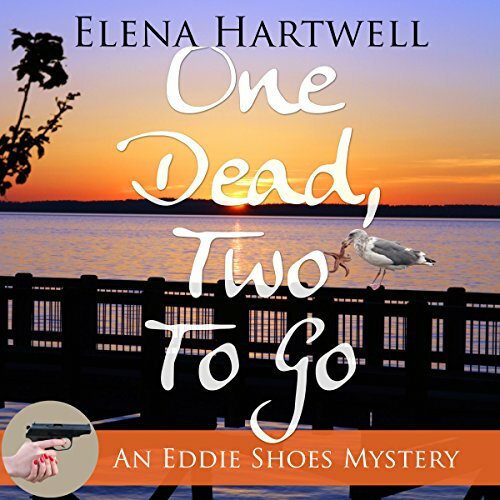 ©2016 Elena Hartwell (P)2016 Audible, Inc.
What a Great New Mystery Series: Eddie Shoes! This is great start to a new series, Edwina Schultz was right to change her name "Eddie Shoes" is a far more appropriate and cool name for a Private Investigator. She herself is cool and feisty, but she isn't one of those hard headed female P.I.s who are always making ridiculous choices that land them in predictably dangerous situations. I enjoyed the plot, being a relatively short book it moves along at quite a pace which keeps the reader interested. Eddie gets a lot more than she bargained for when she takes on the case of the wronged wife looking for hard evidence of her husbands infidelity. When Kendra, the mistress, turns up dead the action starts. Just to add to Eddies problems Chava, her mother turns up. Chava, being a mere 16 years older than her daughter, has not been the most motherly of mothers. Now she has got herself in to a bit of a fix and needs a roof over her head for a while and decides to visit her daughter. She is a wonderfully written character, quirky and just as feisty as her daughter bringing a whole new and interesting dynamic to the story. I hope she stays around a long time as I loved reading about their evolving relationship. Later in the story a mysterious hero comes to Eddies rescue, a fabulous chap, a real big fella whom I'm pretty sure we will all come to love. I thought that this was a thoroughly enjoyable story, well written with fresh and interesting characters, hopefully this is the first of a nice long series. Moira Driscoll was an excellent choice for this book, she gave each character a distinctive and easily identifiable voice. I thought she captured Eddies character perfectly, lively and feisty when appropriate, I especially appreciated how she conveyed all the hidden undercurrents of emotion in the relationship between Eddie and Chava. An all round high quality production. It apparently is a straight "Chick Book"
Would you try another book from Elena Hartwell and/or Moira Driscoll? No the whole narrative doesn't make any sense. What was most disappointing about Elena Hartwell’s story? Too much so called "thinking what other people were supposedly thinking"